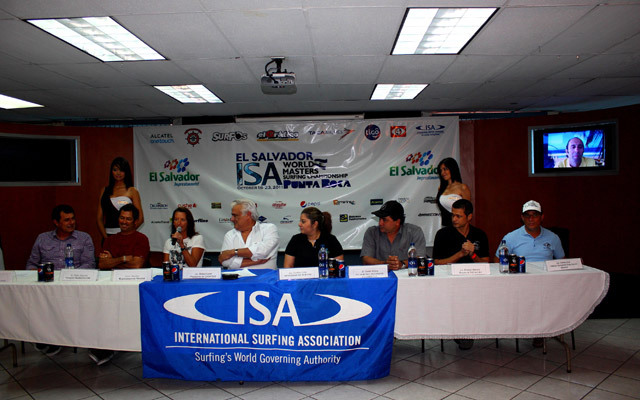 Local government authorities, surfers and ISA representatives gathered for the event’s official press conference today at the premises of El Salvador’s Tourism Department in San Salvador, the capital city. They announced the official opening of the world’s largest Masters surfing event in the sport’s history on Monday at the famous point break, Punta Roca in La Libertad. Dignitaries present were: ISA President, Fernando Aguerre (via Skype); Minister of Tourism Secretary, Carolina Cerna; Mayor of La Libertad, Carlos Molina; President of the El Salvadorian Chamber of Tourism, Rafael Leret, Salvadorian Surfing Federation’s Rodrigo Barraza and event organizer, Grey Line’s Carlos Ortiz. Also present were seven-time Pro Tour Women’s World Champion, Layne Beachley (AUS), three-time ISA Masters World Champion Juan Ashton (PUR) and former Pro Tour star and ISA Open World Champion, Fabio Gouveia (BRA). The event will start on Monday at 8:00 am local time (7:00 PDT and 11:00 EST), and it will be broadcast live on www.elsalvadorisawmsc.com. The Opening Ceremony was postponed at the request of the President of El Salvador, who declared a State of Emergency due to five consecutive days of torrential rain. The Emergency decree is expected to be lifted Sunday evening after the Opening Ceremony was originally scheduled. It has been rescheduled for Monday at 5:00pm local time (4:00pm PDT, 7:00pm EST).